Non-Banking Financial Companies (NBFC) in India – Things to Know! The banks and financial institutes across the globe are primarily responsible to serve a variety of financial operations including deposits and loans. In today’s scenario, financing companies other than banks have also been emerging in the business to serve people’s growing needs and demands in the digital age. Non-Banking Financial Companies (NBFC) are one of the types of finance companies giving a tough competition to banks in certain areas. 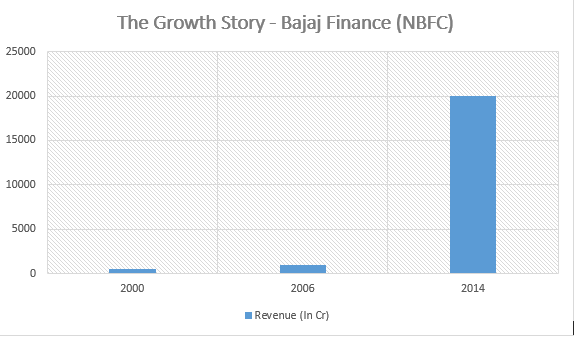 A popular example of NBFC in India is Bajaj Finance that was first set up in the year 1987 and has observed immense success ever since. Below is a graph representing its growth in revenue over the years. Typically, a Non-Banking Financial Company (NBFC) can be defined as a company listed under Companies Act of 1956 and is responsible for giving loans and advances, acquiring stocks/debts etc. issued by governing authorities, leasing, chit funding etc. However, they are nowhere associated with businesses involved in agricultural, industrial or sale/purchase of goods and property. LCs are responsible for providing advances and loans for business or other purposes. AFC is responsible for extending finances for physical assets such as automobiles, earth movers etc. ICs are responsible for acquiring securities like equity, debts, shares etc. A minimum of 75% of total assets involved in infrastructure loans. Net fund of at least ₹ 300 crores. MGCs are those relying on 90% of the income earned from mortgage guarantee and has a net fund ₹100 crores. NBFC-NOFHC is a newly formed bank by promoters holding the bank and financial services and is regulated by RBI. There are more such NBFCs functioning successfully in the Indian Banking and Financial Services market today. Each one has an individual role to play and caters to unique needs of their customers. Who regulates Non-Banking Finance Companies? The NBFCs are not authorised by the RBI to perform payment and settlement systems (NEFT, RTGS, debit/credit cards) in India. They cannot issue cheques or accept demand deposits. Unlike in banks where deposits up to 1 lac are insured by Deposit Insurance and Credit Guarantee Corporation (DICGC), deposits in NBFCs have no such guarantees and security. The NBFC market is expanding in India and has a huge scope to develop further considering the fintech revolution and technological advances of AI and machine learning (ML). If you have been in search of banking solutions that will enable your NBFC to reach new milestones in the financial business, reach out to our experts today. How Business Intelligence is transforming Banking? The Need for Customer Analytics in Banking Today! Address: Embassy Signet, Cessna Business Park, 13/1, Kadubeesanahalli Varthur Hubli, Near New Horizon College, Outer Ring Road , Marathahalli, Bangalore 560 103 .